USB is usually a safe bet, and equipping an external hard drive exclusively with USB 2.0 means that almost any modern computer can use it. But USB 2.0’s pokey performance lags behind the eSATA and FireWire. That said, USB has a renewed appeal for Mac users in light of FireWire’s disappearance from the MacBook ( ) and MacBook Air ( ). 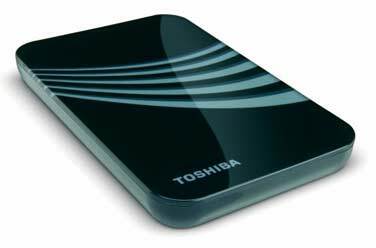 Toshiba’s USB 2.0 Portable External Hard Drive is respectably fast compared to other USB hard drives. The Toshiba drive is also fairly unique-looking as far external drives go; the case reminds me of 1980s art deco or an product placed in a Miami Vice episode. Some users like to have their hard drives make a statement, and I guess this one says you like Phil Collins. The drive is available in a black case with Electric Blue, Carbon Grey, Hot Rod Red, or Gecko Green stripes. The 400GB capacity in the unit we reviewed means you’ll have plenty of room for your photos, music, and files. The Toshiba USB 2.0 External Hard Drive is compact too; it’s slightly wider than an iPhone, making it an ideal pick-up-and-go portable drive. In our benchmark tests, the Toshiba drive performed satisfactorily compared to competing drives when using the USB interface. The Toshiba drive finished our 1GB copy test in 54 seconds, which is about average compared to competing portable external USB drives. The duplication test finished at 1 minute 26 seconds, and this score puts the Toshiba in the range of our current Top Product, G-Technology’s G-Drive mini ( ) when tested over USB 2.0. However, the G-Drive Mini has faster connection options (FireWire 800, and FireWire 400); the G-Drive times when tested with a FireWire 800 connection, for example, finished the copy test in just 33 seconds and the duplication test in 46 seconds. The G-Drive Mini has a much higher cost per gigabyte than the Toshiba drive. The $549 G-Drive has a 500GB capacity, giving it a price per gigabyte of $1.10. In comparison, the Toshiba drive costs $.45 cents per gigabyte. The Toshiba drive has anti-slip footpads on the bottom of the drive ensure it won’t slip and it also has a shock sensor and ramp loading that Toshiba says will help protect the drive’s internal head from crashing. We threw the drive off our desk a few times and the Toshiba drive kept on humming along. Bus-powered USB 2.0 drives won’t work with all computers. We tested the Toshiba drive on an old 1.67GHz PowerBook and couldn’t get it to work. Older Mac laptop models have difficulty producing power sufficient to spin up the drive inside the Toshiba. Toshiba and others who manufacture bus-powered drives offer power booster cables or external power sources to compensate for this shortcoming. Unfortunately, the Toshiba drive’s booster cable uses a short Y-shaped design, meant to draw power from two USB ports on the same side of a laptop, which means it can’t be used to mount the Toshiba drive on the older PowerBook models that feature a USB port on each side. The MacBook, MacBook Pro and MacBook Air models we tested (the current and previous generations) did not need the booster cable to mount the drive. The drive is also available in 160GB, 250GB, and 320GB capacities. Toshiba’s USB 2.0 Portable External Hard Drive is a serviceable drive with a few tradeoffs. While all portable drives have a higher price per gigabyte than desktop drives, performance-minded users will see the Toshiba’s USB-only connectivity as a limitation.